I recently had to buy a new crockpot and with my new crockpot came a small recipe booklet. 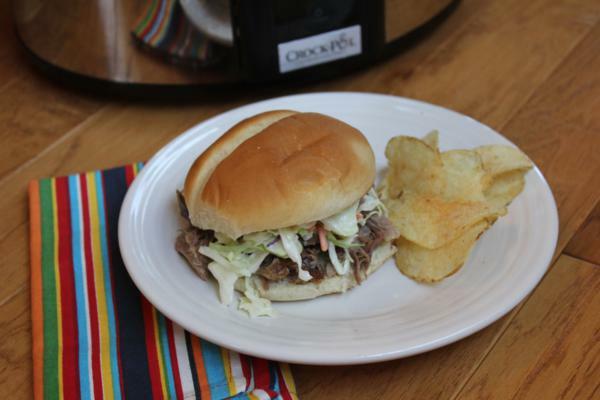 One of the recipes that caught my attention was a recipe for Carolina Barbecued Pork. A friend of ours from church makes a Carolina BBQ Pork that is really good. My husband really enjoys her version. The recipe in this booklet was a little different, but I thought it looked interesting. I am always looking for new pork recipes so I decided to give it a try. I made this the other day and we really enjoyed it. It is nice because it is a crockpot recipe. It was easy to make and it was ready for dinner after I had a really busy day. This recipe has more liquid and is more moist then my friends version. We really like both versions and I am glad to now have two versions of Carolina Barbecue Pork. I changed the recipe a little and cut back on the onions, but overall it is the same basic recipe. Place onions in crock pot. Combine brown sugar, paprika, salt and pepper, rub over roast. Combine vinegar, Worcestershire sauce, red pepper flakes, sugar, mustard, garlic salt and cayenne stir to combine well. Drizzle 1/4 of vinegar mixture over roast. Cover and refrigerate remaining vinegar mixture. Cover cook on Low 10 to 12 hours or on High 5 to 6 hours. Remove meat and onions. Chop or shred meat and chop onions. Serve meat and onions on buns. Drizzle remaining sauce that you refrigerated on top of sandwiches. 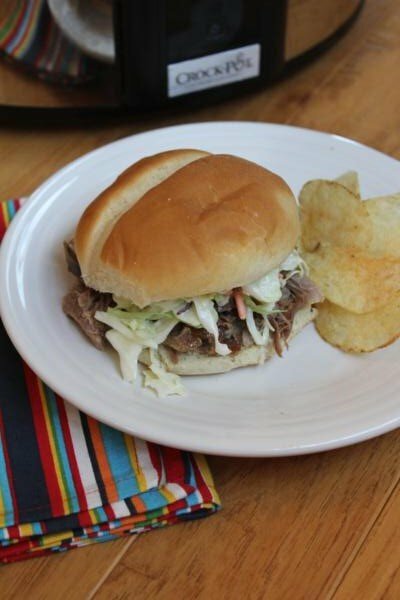 If desired, top sandwiches with coleslaw. Your picture makes me want to make this NOW! But I have something else in the crock pot….another day will have to do. We love pork here. Thank you for sharing this recipe. I can’t wait to try it. This sounds really good. 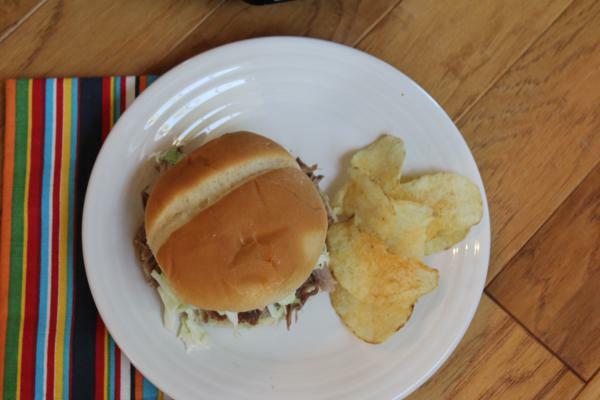 We love pork sandwiches, so I’ll be trying this one! I used to make something similar to this but haven’t for years. Thanks for reminding me about it. Looks good, Lynn, and another one I’ll have to try. i was just thinking the other day how much i’d like to make some good vinegar based bbq. i’ll have to try this out. Do you mind me asking what brand of crockpot you got? We are looking into getting a new one as well, and I can’t even remember what the good brands are. Thanks! @Jessica, My crockpot is actually the Crockpot Brand by Rival. However I am not sure the brands really matter. I don’t think any of them hold up like they used to. The last few I have had only last about 2 years. So, I would get one is a size you want with the features you want more than the brand. I hope that helps. I have been reviewing your pork recipes in an attempt to find a new one for dinner next week. Are the slow cooker pork recipes you feature also a good canidate for brining?? This work this way, but I do now brine it. I think it gives it a better texture that way. I hope you enjoy it. 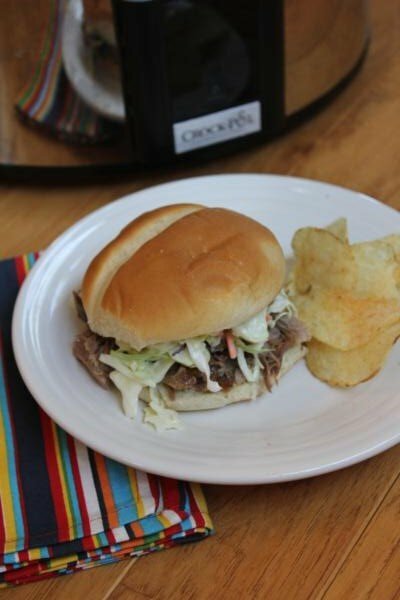 Ok so I already knew tomorrow was going to be a crockpot night and was thinking some kind of pork sandwiches…umm thank you I’m so making this tomorrow! This was amazing. I used pork tenderloin. I added in most of the sauce and sweet daddy ray’s Vidalia onion bq sauce (1/2 cup) at the end. I am glad you enjoyed it. Thanks for letting me know! I hope you enjoy it! We love pork roasts. And I agree pork roasts are often on sale for much cheaper than beef. I think we eat more pork roasts too than beef roasts. I cannot find Gluten Free Buns that don’t taste like sawdust and need 3 glasses of water to choke down…..any suggestions? Some are better than others, but I agree none are quite the same. My kids will eat them, but most of the time I usually just choose to go without the bun. Canyon Bakehouse and Franz Bread are probably my favorite gf buns. The problem for us is that they contain seeds and my daughter can’t have sesame seeds, so both are out for us. Franz is a west coast brand, but I think Canyon Bakehouse is nationwide. If you haven’t tried either of those brands you might them to see if you like them better. I hope that helps.